Comes in a squeezable tube! Herbs & More Vitamin Therapy Aloe Tulsi Cream comes in a regular and plain squeezable plastic tube with a dark green flip top lid. All the information is printed at the back. What I loved about this brand is everything comes sealed so you are sure that you get the brand new product. 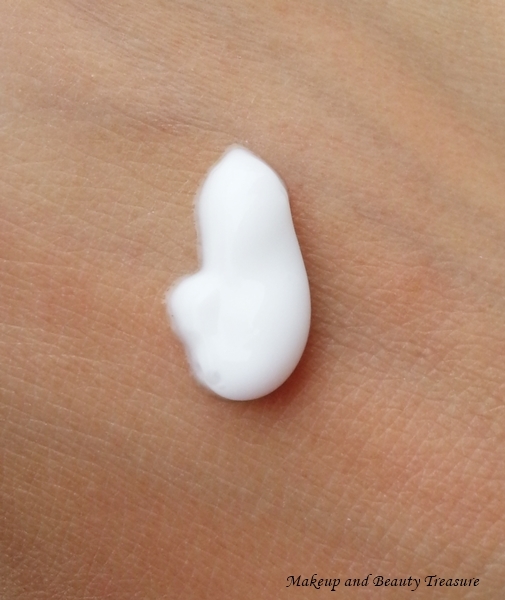 The cream is white in color with somewhat artificial scent. It is a bit strong that I am honestly not fond off but it fades off pretty quickly. It has creamy formula that gets absorbed quickly without feeling heavy or oily on your skin. I love using it as spot treatment. I simply apply and massage it lightly over acne and leave it overnight. I would not say it shows results the very next day but it helps in soothing and reducing redness to a great extent. With regular usage, it does help in treating acne and pimples. I have oily, combination skin and using this cream during daytime causes my skin to become oilier so I avoid using it during daytime. - Easy to use packaging. - Creamy formula that gets absorbed quickly. - Soothes and combats acne and pimples. - Suits all skin types. - Safe for acne prone skin. It does not contain comedogenic ingredients. - Slightly strong and artificial scent. Herbs & More Vitamin Therapy Aloe Tulsi Cream is a good anti acne cream if you are suffering from mild acne and pimples. It soothes and combats pimples and acne. It reduces redness and size of the acne. I would definitely recommend it to everyone who suffers from acne or pimples! - Apply it with Q tip for hygienic purpose! - If you have oily skin, apply it during bedtime. - If you apply it during daytime, do not forget to top it with a compact powder. What is your to-go-to way of combating acne and pimples? Products with strong fragrance is a no for me. Same here but with this product fragrance fades after few minutes! Nowadays most of the youngsters are facing the problem on pimples. The exact solution is take some vitamins hope this cream definitely using in removing the pimples.